Smartphones are now a gaming device as well. Game developers are also considering smartphone version of their PC games. This is the reason, we have so many exciting games for Android as well. Action games are most popular among gamers. So, we have variety of action games out there for Android as well. Action gams include shooting games, fighting games, adventure games and action packed racing games. In this article, I am listing best action games for Android. You can download any of few of these games if you are looking for a good action game to try on your Android Phone. Here is the list of best Action games for Android. You can download any of these games if you like playing action games on your phone. PUBG Mobile is the mobile version of PLAYERUNKNOWN’S BATTLEGROUNDS where you 100 players are dropped in a island and winner tales all showdown. Players have to use available weapons, vehicles and supplies on the island to defeat all other players and survive till the end. The game features realistic weapons, good 3D graphics and fair gaming environment. You can also team up with friends to service the battle. 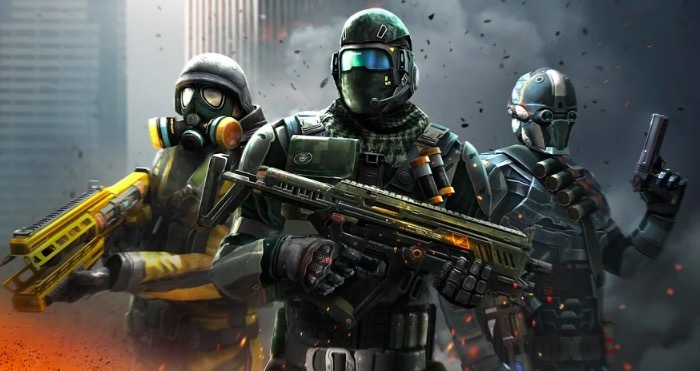 Modern Combat 5 is another nice action game and one of my favourite mobile games. It is basically a first person shooter game with good graphics and online multiplayer action. You can add your friends and play together. Critical Ops is another nice action game where you will experience a thrilling counter-terrorist operation. It is also a first person shooting game that features competitive combat. You have variety of weapons to try and use your skills to win. You can also host private match with your friends on the same maps. The game offers 4 challenging modes where you can test your skills and use several weapons. N.O.V.A. Legacy is also one of the popular action games available for Android . It comes with 3D graphics and awesome sci-fi gaming experience. Not just normal game play, you can also test your skills in multiplayer arena. You can play death match or team death match. Injustice 2 is a popular fighting game (Warner Bros’ big DC Universe) for Android with high quality graphics and interesting game play. You need to assemble a team of super hero like Batman, Flash & Wonder Woman to combat villains. You need to use your characters’ super moves to fight and earn rewards. These rewards help you in customising your super hero and adding more power to it. If you want to kill Zombies, you can play DEAD TRIGGER 2. It is the game where you have to survive in a zombie apocalypse with weapons you get. The game is really interesting and it keeps pushing updates with new content. You have ten regions and can explore 33 unique environments during the game play. This is another nice action game that brings console level of experience to mobile device. The levels and plots keep game interesting. In the game, you will be playing the role of Jake who came back to earth and now fishing with strange creatures. There are 34 stages of overhead action and you have chance to pick equipment based on your need. UNKILLED is a first person shooter game where you have to survive in zombie apocalypse. You can choose one of the five unique characters and join the a elite team to kill zombies and discover the secret behind the cataclysmic plague. There are over 150 missions with interesting storyline. You get unique enemies and bosses to kill in each mission. There are more than 40 weapons to try. So, download and start killing. Asphalt Xtreme is basically a rally racing game where you have to take a break from ordinary territory. It offers 50+ 4×4 Monster Trucks from biggest brands to drive. Not just single races, but you can also go and enjoy real-time multiplayer races where up to 8-players can play. Into the Dead 2 is also a zombie survival game where you have to arm your self with weapons and survive. The game contains 7 action-packed chapters, 60 stages, and hundreds of challenges. You get powerful weapons and ammo perks to use during the game. Cover Fire is a shooting game where you have to war against Tetracorp corporation. It comes with 3D graphics and offers unlimited action. You are a soldier whose mission is to defeat all kind of enemies in the war game by leading a squad of veterans. There is also an online tournament mode where you can play with real people. You get lots of real life guns to use as well. These are few interesting action games for Android. If you love gaming and want some good games to try, you can download any of these games and enjoy unlimited action on your smartphone. There are lots of other games and many will come soon. I will keep on updating this list when I have something new to share. If you also know any good action game that I missed adding in this list, let me know and I will surely update the list. We have several interesting articles on mobile games and mobile apps. You should not miss our older articles. Do not forget to follow us on Twitter and Facebook.